Rev. 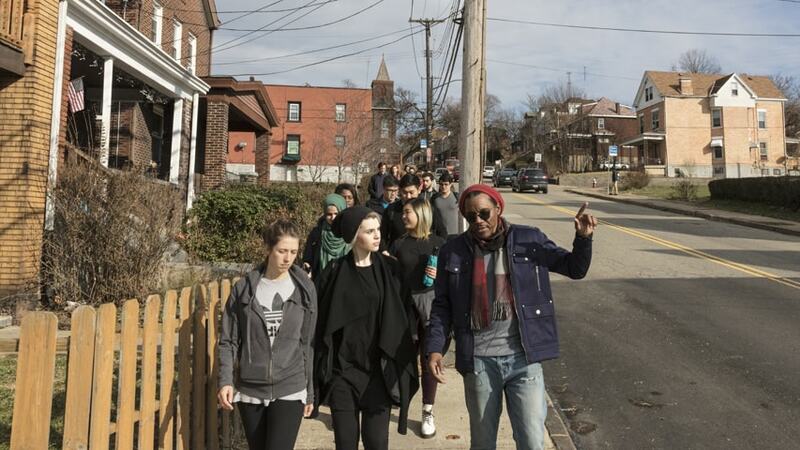 Tim Smith, the executive director of Center of Life, leads students on a walking tour through the neighborhood of Hazelwood. 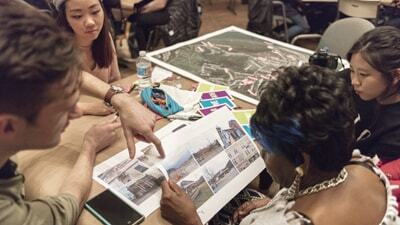 Students in Carnegie Mellon University's School of Design are learning how a community changes over time. "I Lived, We Live: What Did We Miss," this year's senior capstone project, is exploring how the identity and memories of Pittsburgh's Hazelwood community have been affected by urban violence. The class culminates with an exhibit from 5-9 p.m. Wednesday, May 10, at Hazelwood's Center of Life at 161 Hazelwood Ave.
Students Temple Rea and Diana Ji Young Ahn talk with Barbara Robinson about her memories of Hazelwood and hopes for its future. They were looking at photographs, both past and present, as a springboard for discussion. Guiding the students are professors Kristin Hughes and Dylan Vitone, and Rev. Tim Smith, director of the Center of Life, a faith-based, community-empowerment organization serving the neighborhood. Charlie Humphrey, former director of Pittsburgh Filmmakers, is contributing his visual storytelling expertise to the class. "Together, this collective knowledge will help to tell a story about this community in an effort to invite often difficult conversations about loss of human capital, race, power and privilege," Hughes said. "As a society, we often avoid honest and open conversations about difficult subject matter like race, privilege, social exclusion and violence. We must all work together to understand how these types of inequalities result in misunderstanding, racism and loss of social capital." Rev. Smith brings a personal perspective to the project, having witnessed the impact that loss and injustice can have on a community. He has been impressed with the participatory approach and how engaged the students have been with the community. "When a community loses young people too early, it takes something out of it. It changes what the present is, but, more importantly, it directly impacts what the future could be," Smith said. "This exhibit will speak to the fact that it's not normal for young people to die before their parents. It is not normal for people to die in this volume. This project might reach people who are thinking about living that life." Hughes said the students are planning to create a space that will commemorate and shed light on the issues within Hazelwood. Through active listening, hands-on activities and designing alongside community members who have experienced loss firsthand, students are designing an exhibit that will leave an impression on future generations. "So far, our meetings with the Hazelwood community have been very inspiring and eye-opening," said CMU student Praewa Suntiasvaraporn. "We have learned a lot about the struggles they have had in the past, and I am so grateful that the people at Center of Life are so ready to share with us some of the most difficult and saddest parts of their lives." Student Lauren Zemering said the final concept for their installation aims to highlight the beauty within Hazelwood, while giving a voice to its residents and creating hope for the future. "It's easy to get caught up in your own life and those immediately surrounding you, and easy to forget about all the lives outside of our immediate radius," Zemering said. "Meeting with the Hazelwood community has reinforced for me how much you can learn from leaving your bubble." Rev. Smith said the students have been responsive to the community members they have met. "Designers are people who put things together in ways that regular artists don't," Smith said. "Designers tend to understand the human side of community and do interesting research on the communities they work with. This group of students has so many great ideas. It is refreshing working with them." The students' work is captured on their blog.